Tonight’s post is an HDR image from South Mountain, taken last Sunday afternoon just after the last winter storm had moved out of the area. The clouds had started to break up and the bright blue sky provided a beautiful contrast to the white and gray of the clouds that remained. This was my first day out with the 14-24mm F/2.8 wide-angle lens, and it certainly didn’t disappoint, especially on the full-frame sensor of the Nikon D700. 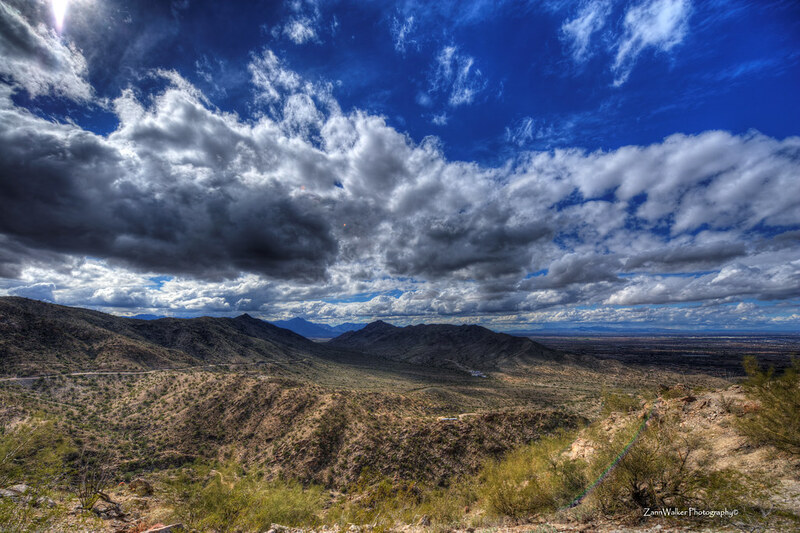 The lens was not only perfect for the interior shots at Scorpion Gulch, it also provided some beautiful wide-angle vista shots of the Phoenix metropolitan area from the mountainside vantage point. I used the tripod and set the camera to shoot 7-bracket series, using increments of +/- 1 (from -3.0 to +3.0). I used my new cable release to trip the shutter because I still haven’t completely figured out how to get the camera to shoot the set using the self-timer. I set the focal length to F/14 to take full advantage of the wide angle. HDR created from five bracketed photos (-2.0/-1.0/0.0/+1.0/+2.0) processed in Photomatix v4. Post-processing in Paintshop Photo Pro X3. 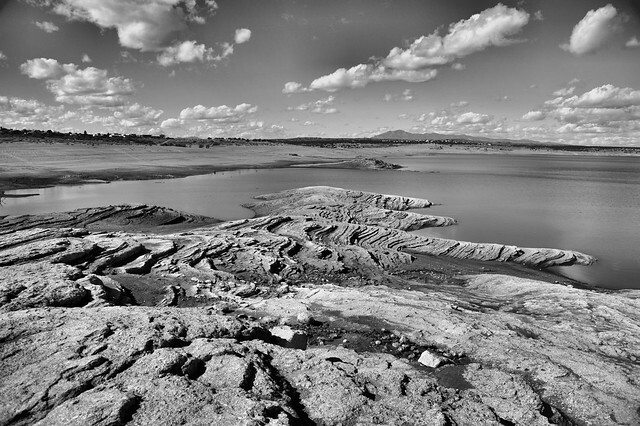 For this shot I actually wound up using only five of the brackets, discarding the most under-exposed and over-exposed. There’s a little bit of flare from where the sun was just starting to peek through the clouds, but I kinda liked it so I didn’t try to get rid of it. Make sure you click on the photo to view it large. On a different note, I got my new flash in the mail today, a Nikon SB-700 Speedlight. I have an appointment on Saturday morning to do a lifestyle portrait shoot with a friend I worked with at the library. She’s just adopted a new dog, so this will be people/pet photography practice. I’m hoping to get a little practice with the new flash as well, even though the shoot will take place outdoors. 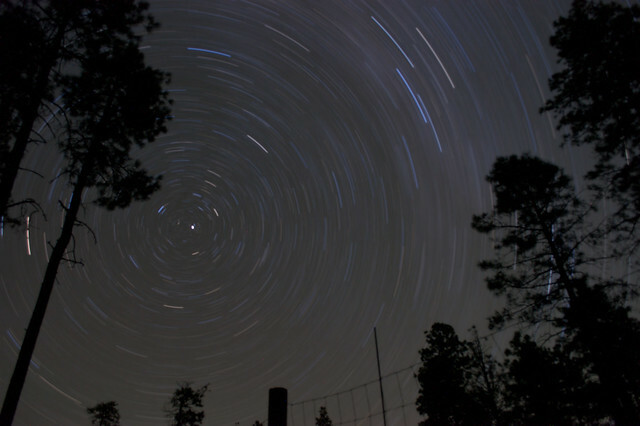 We just got back from a four-night camping trip to the Mogollon Rim, northeast of Phoenix, Arizona. We stayed at the Canyon Point Campground about twenty miles east of Payson, at about 7,000 feet altitude. The temperatures are about 25-30 degrees cooler than they are here in Phoenix, which was our primary consideration when choosing a campsite (it was about 108° when we left town on Monday). Of course, my camera equipment was my most important gear on this trip. 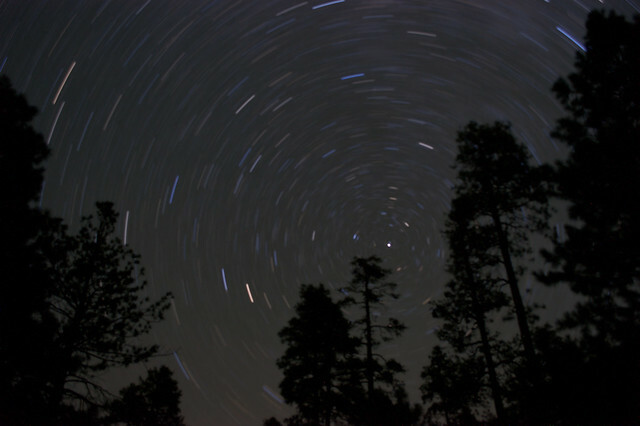 I knew that we were going to be out in the National Forest during the new moon, so we should be able to see tons of stars, and my goal was to make my first attempts at shooting star trails. I have read Harold Davis’ book “Creative Night“, which has some great tips for shooting just about anything after dark. However, my Nikon D5000 doesn’t have quite all the bells and whistles as a more expensive camera does–plus I’m still a novice at photography in general. So, although I picked up some good information from his book as well as some other websites, I was pretty much winging it when it came to figuring out exposure times and settings. I was very happy with this shot, as I thought it had a nice balance between the star trails and the ambient light which silhouetted the trees. There was still quite a bit of noise in the photo, however, but I’m not sure how much can be removed without destroying the star trails. Each of these were shot in raw NEF format and processed in Paintshop Pro X3. On each one, I tweaked the contrast and sharpened slightly. On a couple of them, I used PSP’s noise reduction option, but didn’t get the results that I was looking for. Regardless, I had a great time hanging out in the dark, experimenting with a type of photography that I haven’t done before. Since we can hardly see the stars at all here in the city, it was a treat just to be able to sit under the night sky and marvel at the vastness of the Universe. 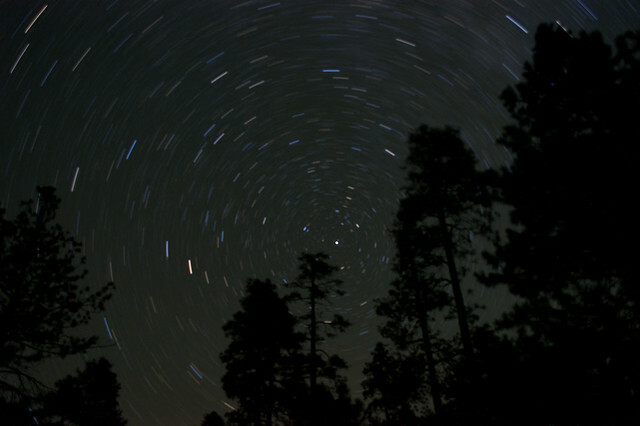 But seeing the star trails in these photos reveals what a wondrous marvel of celestial engineering exists up there! 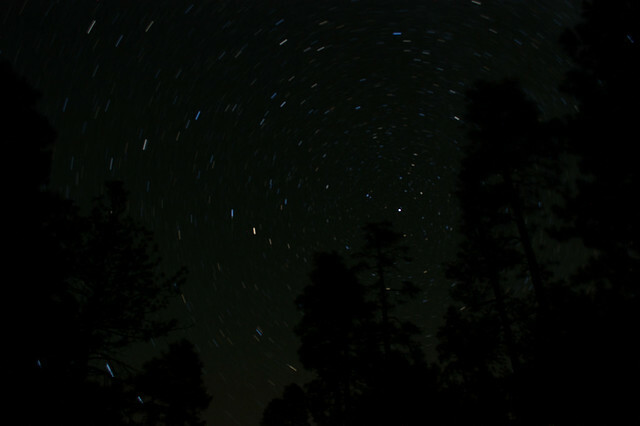 We lost track of the number of shooting stars that we saw, including one huge, really bright one that left a sparkling gold trail behind it. I can’t wait to go back and try these again. 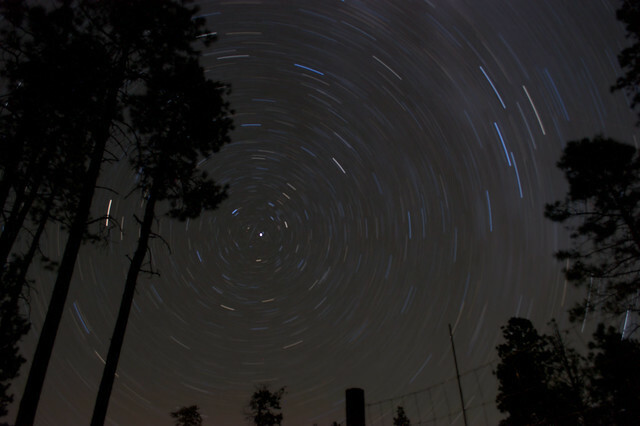 I’m hoping that some of my blog readers can offer some tips and suggestions on ways that I can improve my star trail photography. What equipment do you use for this type of shot? What post-processing steps could I use to make them better?